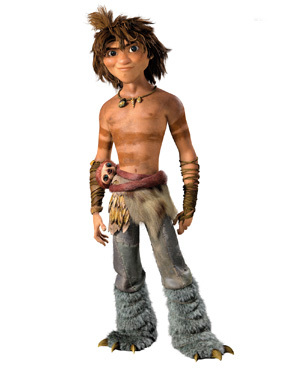 Earlier this year we got our first look at DreamWorks Animation's caveman family comedy The Croods. Featuring the vocal talents of Nicolas Cage, Ryan Reynolds, Emma Stone, Clark Duke, Cloris Leachman, Catherine Keener and more, the film follows an introverted prehistoric family, who find themselves guided out of their cave into this dynamic world by a resourceful newcomer (Reynolds) who may bring more stress than relief to the patriarch (Cage) of the family. Now we have a new photo of the whole family, Reynolds' character Guy, and some very detailed character descriptions from the two filmmakers. Gran (voiced by Cloris Leachman): “She’s like this ferocious, almost crocodile-type woman,” DeMicco said. “We always say: ‘She’s older than dirt — some say she’s 45. She has lived a very long life in a short amount of time.” She is the main antagonist for Grug, Nicolas Cage’s pater familias. Co-director Chris Sanders says,"Guy is human being 2.0; he’s not as a strong as the Croods but he’s more about using his brain. When they discover he can make fire, they kidnap him, stick him in a hollow log, and keep him." But the plan turns out to stir some trouble for the family's leader. Sanders says, "This is really Grug’s nightmare. Guy is full of ideas. 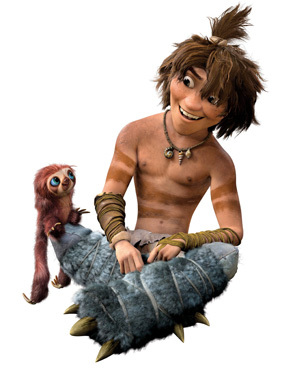 Croods don’t really have ideas.” This makes Emma Stone's character fall for him pretty hard. After all, introducing people to the concept of shoes would be a pretty smooth move to get all the cave ladies. How To Train Your Dragon collaborators Chris Sanders and Kirk DeMicco are co-directing this prehistoric animated feature film, which was also developed with the help of Monty Python troupe member John Cleese. The film follows The Croods, an introverted family, who find themselves guided out of their cave into this dynamic world by a resourceful newcomer (Ryan Reynolds) who may bring more stress than relief to the patriarch (Nicolas Cage) of the family. Catherine Keener, Emma Stone, Clark Duke and Cloris Leachman also voice characters in the DreamWorks Animation film slated to theaters in 3D on March 1st, 2013. Translation: "I'm a homophobe and too cheap to buy a hotel room"! Snoozefest indeed. Dreamworks makes mediocre crap and markets the hell out of it. Don't be fooled. Their films are garbage.